KPLU, Seattle raised in-lieu fees to match the one applied for South Lake Union in the spring. This week Seattle City Council took an important, but preliminary step to improve Seattle’s policy tools to build adequate affordable housing. Council plans to raise in-lieu fees developers pay in the downtown area that fund affordable housing in an effort to match fee increases passed for South Lake Union this spring. Council hopes to encourage developers to build affordable housing in their buildings (sometimes called on-site) by raising the in-lieu fee to a level comparable with the cost of building affordable units. Developers rarely, if ever, build affordable housing on-site. Because the fees are too low, developers choose to pay the fee and move on, leaving a considerable gap in the available affordable housing stock in the city, particularly downtown. Creating a program that results in actual affordable units included in market rate developments is critical to achieving Seattle’s incentive zoning program goals. When local governments create significant value for developers through major infrastructure investments and allowable height increases the public deserves benefits in return, like affordable housing. Building affordable housing alongside market-rate housing ensures more people have access to high opportunity neighborhoods and encourages mixed-income, diverse, inclusive communities. This goal is a direct response to historic exclusionary housing practices that have segregated American cities and regions by race and income. Creating more housing opportunity in the urban core for the full income mix of Seattle workers means fewer people will need to drive into the city from far-flung suburbs. Raising the in-lieu fee is a common sense action needed to meet these goals. If the in-lieu fee remains too low, developers will understandably continue to pay a low fee rather than build affordable units in their projects. Council’s action this week is preliminary. When you consider past research on the question and compare Seattle to other cities, (look for this comparison soon on Sound Progress) the results suggest that the in-lieu fee will still be too low to make on-site construction of affordable units attractive to developers. Over the next six months, City Council and the Mayor’s office will learn from national and local experts in an effort to build a program that results in a significant number affordable units and real inclusion. * Upon re-reading this post, I want to clarify this statement: by market rate development, I mean commercial development that fosters new low-wage jobs (20% in the downtown area according to a recent City study), in turn requiring new affordable units it the region. Categories: Affordable Housing, Community Benefits and Development, Equitable Transit Oriented Development, Sustainable Communities | Permalink. Today Puget Sound Sage released a new report examining the economic impact of SeaTac’s living wage initiative, Proposition 1. Click here for a copy of the press release. According to the analysis, worker spending will multiply, resulting in up to $54 million of increased income for the region and more than 400 new local jobs. This increase in earnings and spending will mean more revenue for local governments to pay for improved infrastructure such as schools, parks and public safety. Over six thousand workers will receive an average wage increase of $3.97, or about a 36 percent boost. Covered workers would see earnings rise from an average of $17,700 to $24,000 per year. Workers will spend their increased earnings at local businesses, restaurants and stores. The paycheck boost along with worker spending will result in a total of $54 million in increased household throughout the region. 15-20 percent of this household income boost will be received by SeaTac residents, resulting in increased revenues for small businesses and the City. Wage increases under Proposition 1 could be absorbed by marginal price increases between .5 percent and 1.5 percent for the customers of covered businesses. The majority (68 percent) of revenues enjoyed by covered employers comes from visitors to the region, resulting in a net economic gain. 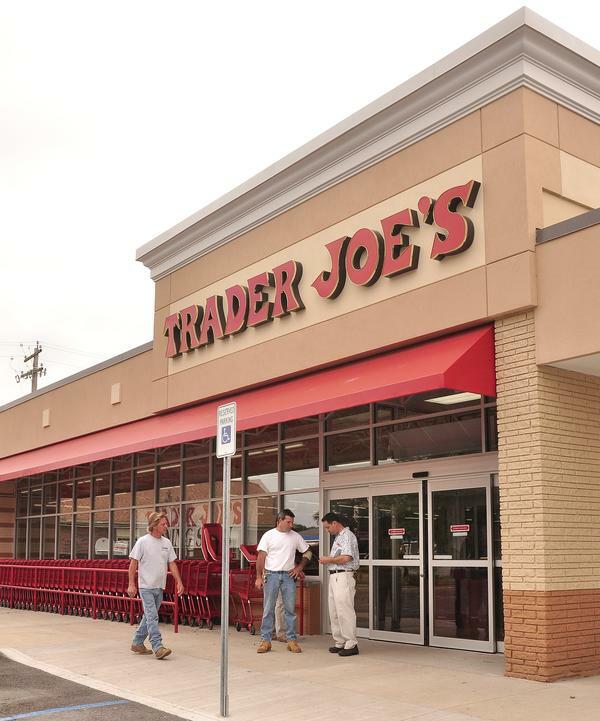 Last week Trader Joe’s announced it would drop employees working under 30 hours a week from health insurance coverage, counting on the public health care exchange to pick up the cost of covering its workers. This low-road labor strategy will shift the cost of providing health coverage to their workers to public institutions in the form of medical entitlement programs, the state health care exchange and public health programs. Essentially, tax-payers will pick up the tab. Trader Joe’s joins Home Depot in announcing they plan to exploit loopholes in the Affordable Care Act by cutting part-time worker coverage. The employer mandate under the Affordable Care Act was supposed to go into effect this year; however the Obama administration delayed its implementation to give employers more time to come into conformity with new IRS rules. Rather than seeking ways to meet the requirements many corporations, especially those in the low wage food service, grocery and retail sector, are instead finding new ways to get around the law. Here is the bad news for the Puget Sound region. Trader Joess is not the only employer in the region cutting off access to health care for low wage workers. Recent negotiations between the region’s United Food and Commercial Workers union (Locals 21 and 367) and the large national grocery chains (Safeway, Kroger and Albertsons) have seen proposals by the grocery retail industry to cut employer based health care for any workers who fall below the 30 hour full-time threshold. Private sector employers in Washington are increasingly pushing employees into contingent work (part-time, temporary or contract.) The number of people working part-time involuntarily because they cannot find full-time work has more than doubled over the last decade. The grocery, food service retail sectors where jobs tend to pay low wages are among the sectors most reliant on part-time workers. Grocery and Retail employers are using fluctuating schedules “short-shift” workers. In our survey of grocery and retail supercenter workers a majority (57%) of respondents reported that their employers fluctuated their work hours by as much as 10 hours from week to week. Because IRS rules have allowed long “look back” periods to determine an employee’s status as above or below the 30-hour requirement, employers can avoid the mandate by keeping a worker’s hours at an average just below the requirement over the course of a year. Grocery and retail service sector employers have been steadily raising eligibility requirements for PT employees to qualify for health insurance. Cost sharing is also increasingly pricing many workers out of coverage due to high premiums, deductibles and maximum out of pocket costs. Grocery retailers not constrained by collective bargaining contracts are requiring workers in the Puget Sound region to pay up to a third of their gross earnings on premiums and qualified medical expenses. In addition, next week Puget Sound Sage will be releasing a policy briefing showing how grocery and retail supercenters are forcing their workers to work without pay and off-the-clock. Categories: Living Wage Jobs | Permalink. 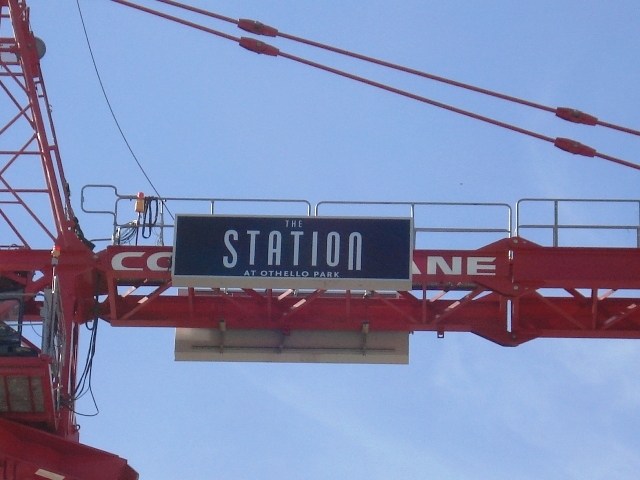 Construction cranes dot Seattle neighborhoods as residential development continues to boom. Despite hundreds of new units online, rents for households across the income spectrum are rising. Lack of affordable housing for low and middle wage workers is a problem across Seattle neighborhoods. The experience of Southeast Seattle neighborhoods mirrors that of more affluent areas, like Green Lake and Ballard. According to the Puget Sound Regional Council the value of parcels around light rail stations in Rainier Valley rose an average of 513% since light rail construction began. In that same time period, the price of rent in Rainier Valley doubled from $500 to over $1,000. Rising rents strongly indicate gentrification in neighborhoods like Rainier Valley. Gentrification alone does not necessarily cause displacement, but it creates the conditions for it. Largely by increasing the cost of living, gentrification creates a downward pressure on low-income residents. Without anywhere to gain an economic edge, low-income residents are eventually forced to seek housing elsewhere and are displaced from their neighborhoods, as Alexa Vaughn thoughtfully describes in her Times article. In order for middle and low-income households to benefit from new investments and development the supply of permanently affordable housing and other community infrastructure, like strong cultural centers and small businesses need also need to thrive. Vaughn’s article also echoes Seattle’s overarching narrative on gentrification: that “market forces” are to blame for the displacement of low income residents, and that “revitalization” springs from wealthy newcomers. This narrative needs to be challenged. To assume that prosperity from new development can only benefit Seattle’s wealthy “professionals” is a false dichotomy. To allow Seattle to continue to blossom into a City that values diversity, innovation and equity policy makers need to look beyond the constrains of narrow minded economics and build an economy that works for everyone. Neighborhood revitalization only works if it benefits the current residents of the area in question. Gentrification gives the appearance of “solving the problem” of urban poverty and neglected city infrastructure. Renovated storefronts and apartment buildings attract new tenants, new businesses, and new clients. From an external perspective, this rebirth is a much needed change for economically depressed neighborhoods. However, people living in these neighborhoods are faced with a much darker reality as their rents begin to rise and they are forced to choose between forfeiting even more of their income to pay rent or giving up their homes altogether. 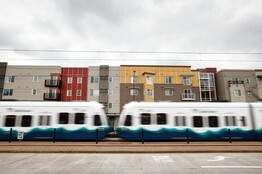 New apartment complexes are not the only culprits; light rail and transit oriented development have also played a hand in displacing local residents who can no longer afford to live in the area. As prices rise, hard-working tenants are pushed further from their jobs and back into cars (undermining the environmental goals of TOD.) Families are pushed further from their social support networks. 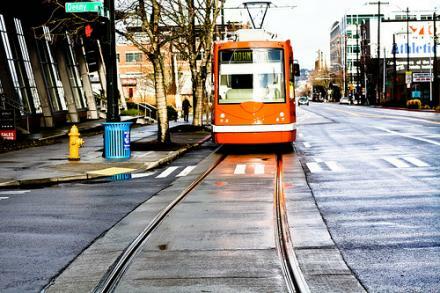 Tenants without vehicles are pushed further from public transit. Growth, investment, and revitalization are not inherently bad. They can be very good. However if policy-makers don’t adopt measures to protect residents, these come to undermine structures that support healthy communities and economies and create greater barriers to economic stability for individuals and families. If we don’t create policies to protect tenants and ensure truly equitable growth, this problem will only continue to create greater inequality and economic instability. Categories: Affordable Housing, Community Benefits and Development, Equitable Transit Oriented Development, Racial Justice, Sustainable Communities | Permalink. Some opinion makers point to a move made in Washington State, in 1998, to index the minimum wage with inflation. As a result, many other states have seen the minimum wage remain stagnant: without adjusting to inflation, a person who earns minimum wage effectively earns less than they did the year before. However, the state of Washington’s minimum wage has only kept at pace with its original intent – to set a bare minimum rate of payment to prevent blatant abuse of workers. That is all. 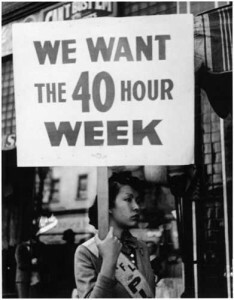 To put this in context, the Fair Labor Standards of Act of 1938 that established a minimum hourly wage also banned oppressive child labor, and established the 40 hour work week. The minimum wage is exactly that – an absolute bare minimum to halt exploitation. Yet, even many opponents of raising the minimum wage would agree that the minimum wage is not a livable wage. The minimum wage is a poverty wage. Let’s examine even the highest minimum poverty wage – $9.19 an hour. This adds up to about $19,100 per year for a full time worker working 2080 hours per year, after the federal income tax, this can be as low as $16,700 in a workers pocket. In Washington, the average cost of housing, utilities and transportation for one single adult is roughly $16,850 per year. This leaves no room in a single adult’s budget for health care, food or savings. When you add the costs of supporting children, this income becomes even more unsustainable. To get by, households go into debt or utilize other services to make sure their families get the services they need. This is why the local living wage movement took hold twenty years ago in Baltimore when faith leaders working in homeless shelters and soup kitchens began to realize that many of those who were using their services every single day were people who held jobs. Since 1994, the living wage laws became effective ways for cities and localities across the United States to address poverty and boost their local economies. However, this movement largely bypassed Washington State. Even though our state has the highest minimum poverty wage, we only have one city with a living wage law on the books – Bellingham. Their policy only covers industries that contract directly with the City of Bellingham. Proposition 1, which would set a living wage of $15 an hour for certain transportation and hospitality workers in the City of SeaTac would be the second living wage policy in Washington State and one of dozens across the country. For more information about Prop 1 read our posts on who is covered by the policy and why it is not the highest, nor a minimum wage. Categories: Living Wage Jobs, Port Jobs, Uncategorized | Permalink. 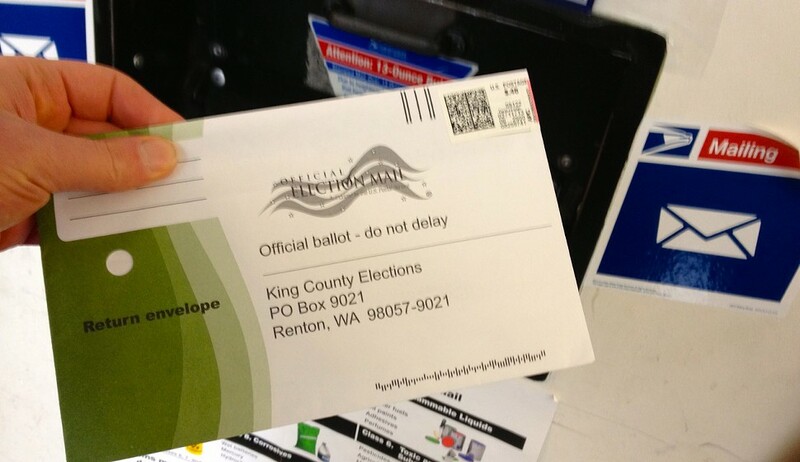 After months of legal challenge, SeaTac’s Proposition 1 is finally going to the November ballot after three judges over-ruled a lower court decision to stop it. As media attention has zeroed in on the courtroom drama, much of the debate rhetoric has referred to Proposition 1 as the highest proposed “minimum wage” law in the country. Here’s the thing – it’s not a minimum wage, nor is it the highest wage requirement in the country. On the west coast that honor goes to Los Angeles’ airport where the living wage floor is set at $15.37 an hour (plus paid sick leave and minimum training requirements). According to National Employment Law Project, the highest airport living wage in the country is Saint Louis at $15.92 an hour. Other airports have lower wage floors, but over twice as much paid time off than the 5 days proposed by SeaTac Proposition 1. A minimum wage typically refers to a universal wage threshold that raises the floor for all workers. Some cities, in fact, have adopted broad minimum wage ordinances, similar in scope to Federal or state minimum wage laws – San Francisco, Santa Fe and, more recently, San Jose. “Living wage” initiatives and ordinances, on the other hand, typically cover a narrower group of employers, such as airport employers (see our report Below the Radar) and hotel employers. Although it’s true that these ordinances do increase the wage minimum for a group of workers, they are not universal. Why does this distinction matter? Using the term minimum wage implies that all workers in the city will be covered. This could be misleading to voters. Accurately representing the initiative in media stories may frustrate copy editors and journalists as it requires longer, potentially clunky sentences. But clarity for voters seems imperative. There are two ways that Proposition 1 does not fit the mold of a minimum wage. 1. The initiative only applies to travel-related business. 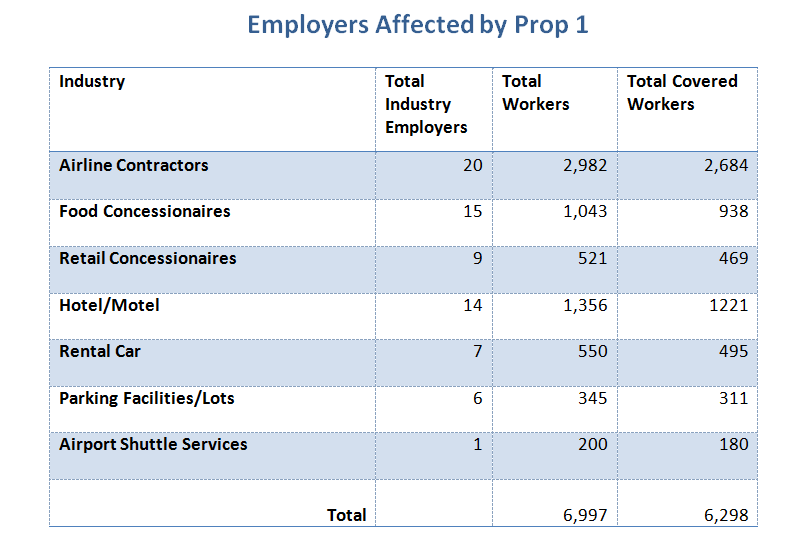 The scope of coverage is narrowly limited to transportation employers (e.g., airport, shuttle and parking) and hospitality workers (airport concessions, hotels and conference centers). See this post on who it actually covers. Airport businesses with 24 or fewer non-managerial employees. Ground transportation businesses (like car rental agencies) with 24 or fewer non-managerial workers and less than 100 cars, 100 parking spots or 10 vans, depending on the type of company. Hospitality businesses with 29 or fewer non-managerial employees and less than 100 rooms. Airport concessionaires with 9 or fewer non-managerial Employees. Who is Covered by SeaTac’s Proposition 1 (and Who is Not)? Now that the legal dust has settled the Good Jobs Initiative which goes to the ballot in November, the public debate can shift to more important matters like what would this living wage initiative actually do? That’s why Sage has crunched the numbers to determine which employers in SeaTac would be impacted by Proposition 1 and how many workers would receive increased wages, paid sick days and other provisions. Based on a close reading of the initiative language and careful analysis of available data, here is what we found. If adopted, we estimate that nearly 6,300 jobs at 72 businesses will fall under new employment standards. This represents about 25% of all jobs in the city of SeaTac. The table below shows the breakdown of affected jobs by sector. Approximately 20 airline contractors comprise the most affected employer group, with 43% of all covered jobs. These include multi-national firms such as Menzies Aviation, Swissport, and DGS. Food and retail concessionaires contribute another 22% to the total number of covered jobs. This includes the two airport concession giants, HMS Host and Hudson News Group, but also airport restaurants such McDonalds, Wendy’s and Anthony’s. About 14 hotels and motels with over 100 rooms will be covered by the new employment standards, contributing about 19% of covered jobs. The three largest hotels in SeaTac are the (Hilton) DoubleTree, the Marriot and the Hilton. Restaurants directly operated by large hotels are also covered. An estimated 14 ground transportation employers comprise the remaining 16% of affected jobs. This group of employers include Hertz, Avis, Shuttle Express and Masterpark. So, which businesses are not covered? By narrowly targeting air-travel related business – specifically, hospitality and transportation – Proposition 1 leaves locally-serving businesses out. For example, stand-alone restaurants in the city, such as Pancake Chef, Dave’s Diner and Galliano’s will not be affected. Also, grocery stores, bars, coffee shops, convenience stores, gas stations, and other retailers outside the airport will not be covered. Our analysis of existing businesses in the various SeaTac industries shows that no non-profit or community service organizations will be affected either. Finally, Proposition 1’s definition of covered employers explicitly excludes government agencies and airline employees like flight attendants and pilots. Small businesses inside the airport with 9 or fewer non- supervisory, or non-managerial employees are not covered. According to Port of Seattle badge data, there are a number of storefronts that fall below this employee threshold. Some of these businesses include: Roger’s Shoe Shine, Bose and Rosetta Stone. Many of the restaurants and shops inside SeaTac Airport that may appear to be small standalone storefronts are, in fact, operated by larger companies like HMS Host and Husdon who have hundreds of employees in the airport.